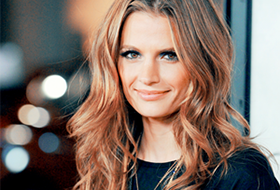 Stana is fluent in Serbian, French, English, Croatian and Italian. 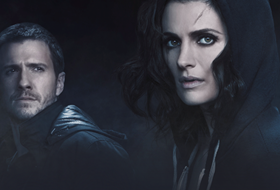 On Heroes, Stana had to put on an Israeli accent to suit her role. She is also adept in speaking with the following accents: Eastern European, Spanish, South African, Italian, Irish, Greek, and British. Much like her character Kate Beckett, Stana is an avid reader. She also has a strong interest in environmental issues, archery, and music. Her hometown is Hamilton, Ontario, located about an hour from Toronto. Stana is a very accomplished actress as she has been taught improvisation, film and stage combat and many other essential skills. For her role as a Russian assassin in Stiletto, she trained in knifing techniques and Certified Navy Seal skills. Stana took up advanced scene study from Columbia College and in Los Angeles. She also trained in belly dancing at the Canadian Royal Dance Academy and in Isshinryu Karate in Chicago. She has also acquired an extensive knowledge of Shakespeare’s works from attending the Goodman School of Drama in Chicago. In 2009, Stana was named as one of Entertainment Weekly‘s 15 Smartest, Sexiest Women Crime-Fighters for her role as Detective Kate Beckett. Enjoys Soccer, Yoga, Karate, Baseball, Softball, Basketball, Horseback Riding, Swimming. On stage, she has starred as Hotlips in a production of MASH. She also played Yvonne in the comedy Private Fittings by Des McAnuff. During her time away from work, Stana loves to travel and explore different places. In Summer of 2009, she toured with an archaeologist and visited temples and ancient burial sites in Polynesia. Is the eldest among six siblings, with about seven years separating her from her youngest sibling. She was born to a Serbian father and a Croatian mother who hail from the Dalmatian Coast in Croatia and immigrated to Canada, while it was still part of the former Yugoslavia. Her family owns a real estate and furniture business.